This text provides a comprehensive, state-of-the art review of this field, and will serve as a valuable resource for clinicians, pathologists and researchers with an interest in GVHD and its mimickers. The book reviews new data about risk factors for the disease, pathologic features, profiles the new WHO guidelines as well as current practices. It also provides examples of various presentations of GVHD in Skin, GI system, and Liver in addition to major teaching points through patient based teaching cases. Comparative gross and histologic pictures of GVHD are provided. Another unique aspect to this text is the implementation of patient cases as the focus for the major chapters to be the discussion initiation points, making the reading and teaching more interactive with the readers and at the same time providing a stimulating discussion of difficult differentials. Bonus cases are also added to showcase important differentials with similar morphologies. 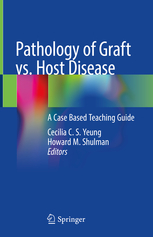 Pathology of Graft vs. Host Defense will serve as a very useful image heavy, case based resource for physicians and researchers dealing with, and interested in, this challenging disease. It will provide a concise yet comprehensive summary of the current status of the field that will help guide patient management and stimulate investigative efforts. All chapters arebe written by experts in their fields and include the most up to date scientific and clinical information.